With the DRB short a member due to a resignation and the absence of another member, the Gaythering elected to move consideration of its application for a pool to the March meeting. This follows a lack of quorum at the January meeting resulting in its cancellation. The Convention Center park will be located on what is now a surface parking lot currently being used as a staging area for construction. The proposal was back before the Board for modifications to accommodate Design Miami which has signed a long-term agreement with the City. Maria Hernandez, Convention Center project manager, told the Board the design, which blends greenspace and trees with the large Design Miami tent, was inspired by the Frieze Art Fair in London’s Regent Park. 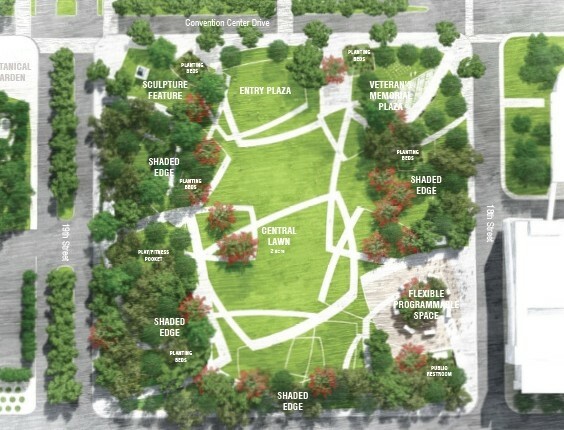 Through the modification, the park gains a central lawn with shade trees around the perimeter. She emphasized the design included the same number of trees as the original and increased the amount of greenspace. 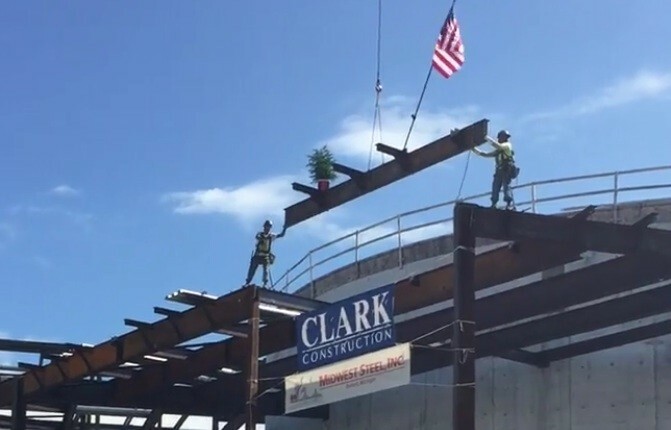 The park will include a veterans plaza, sculpture through the Art in Public Places program, and a fitness area, as well as a service area that doubles as flexible space for future activation and programming. Hernandez said construction is expected to commence in early 2019 and be finished that summer. Daniel Vecini, Creative Director for West 8 Urban Design and Landscape Architecture, said the design incorporated a “very strong shaded edge” in a u-shape that opens to the Convention Center, creating a central lawn “almost like a tropical version of a Bryant Park here in Miami”. While there is space for Design Miami for two months out of the year (including load in and load out), during the rest of the year it becomes “a place for people to walk their dogs and see the open green”. Vecini said by increasing the amount of greenspace, there are more permeable surfaces “which is much better for the environment and the eco-system”. The central lawn (pictured above) includes winding paths that Vecini said “draw you in” from the shaded perimeters. The lawn provides capacity for a 17,000 sq. ft. tent while including the same number of trees – 163 – around the edges. The design, he said, shows tents can also be placed in greenspaces and parks, “not just parking lots”. The surrounding trees “hug” and “mitigate” the tent. There will also be screening for the utilities and pump station on the site to blend into the green and hide them from public view. Vecini said the 2,500 sq. ft. veterans plaza provides “a moment of dignity” in the park. Both Vecini and Hernandez discussed the flexible programming space which could include markets, kiosks, and food trucks. The fitness zone is a 1,000 sq. ft. space that will be defined by the Parks and Recreation Department over time. Plans also include a public restroom. In response to a resident question, Hernandez said the original restroom design called for two individual stalls that are no longer preferred by the Parks Department due to security issues. It is also too small, she said, having learned from the restroom facility at the nearby Soundscape Park. The ultimate design will be a more open restroom with a pulldown grill that closes it off when the park is closed. With regard to concerns about the flexible programming space and “event fatigue” raised by the resident, Chief Deputy City Attorney Eve Boutsis said all programming would go before the City Commission and residents would have the opportunity to comment at that time. Vecini said the reorientation of the Design Miami tent to be in the center of the park and perpendicular to the Convention Center rather than parallel to and up against Meridian Avenue “will take the pressure off the neighbors on Meridian”. In addition, Hernandez said, the entrance of the Convention Center has been reoriented to Convention Center Drive. “We no longer have a double-sided convention center so there’s no more drop off on Washington Avenue … activity is centered around Convention Center Drive and away from the residents.” There will still be a pedestrian entrance on Washington Avenue so guests in area hotels can walk but the main drop off point will be on Convention Center Drive, she said. Four members of the Board then voted to approve. Member James Bodnar opposed. Details on the Convention Center park plans.